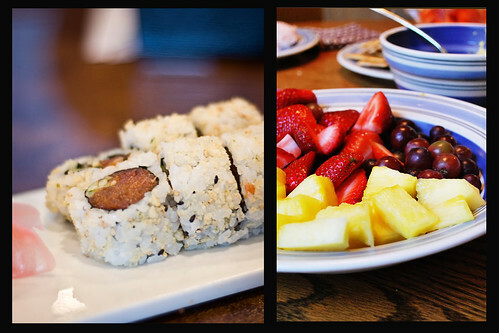 it's amazing how foods that don't really go together, look really cool in side-by-side photos! That does not look like a bunch of random food, that looks like a party platter. Random food from my fridge right now would be cilantro, cheese, and ketchup. Oh, and corn tortillas. It looks like you two are creating some great party set up. Yum! Every time I look at these photos I get hungry! I am having so much fun being your partner! Ok. I'm hungry now! These look great together even though they are so different! What beautiful colors with all that friut...Party platter in deed! I think the theme lunch would have been fun to do. There's so many choices! These two look beautiful together. Great shots! Just awesome. I don't know of anyone who wouldn't want to eat after seeing these - off I go to the fridge :) Great job mama! Looks better than my lunch! Yummy indeed! I have to say, both of your lunches put mine to shame! Yum! The colors are gorgeous. And as "eclectic lunches" go, this looks pretty darn tasty. I love the vibrant colors of your photo, paired with the texture in Cara's shot. Wonderful shots, ladies! confession time right here: i've never had sushi. still, that's a great photo. i love the colors of your photo jen! my mouth is watering just looking at all those tasty fruits! These shots are wonderful. They make me hungry and I just ate. love the colorful fruit. I can almost taste it.